It was early when I wrote that - still is. I do mean Mesopotamia when I say "East". The other cultures are West of Egypt. I don't think you get Channel Five in Belgium...it's surprisingly good when it comes to Egyptological programmes. there was one about the new mummy exhibition at the British museum on Friday. Channel 4 and BBC are also good. True, but I had another thought about that as well. As most cultures do, Egypt really originated out of war. It's a hateful thing to say but sometimes war is just the only thing that gets things in motion, starts an evolution. This happened in Egypt, just like it did anywhere else. First there probably were a bunch of settlements (very accurately put, Bart...), later on to evolve in the two kingdoms that Narmer-Aha or Menes eventually united. What I want to say is that the main reasons for war are always territory and power. Now this could only mean that by the time of Menes the population must have grown enough to make this need for territory an actual reason to unite something that was getting pretty close to a very large state. But since there's so little proof of a rather large or consistent population across the banks of the river Nile, between 5000 and 4000BC it does give rise to the probability of a rather large scale immigration. But since there's so little proof of a rather large or consistent population across the banks of the river Nile, between 5000 and 4000BC it does give rise to the probability of a rather large scale immigration. I was referring to the main centres of habitation to be the region of Hierakonpolis and Naqada. For the rest... Egypt is a big country but there seem to be only limited sources about its prehistoric past. Where "the rest" often is nicely preserved. Next to Naqada and Hierakonpolis u also have this site "Mother of Pottery", Umm el-Qaab I think, but I'm not sure. A major resource for prehistoric and early historic evidence, situated around Thebes I think. I know Belgian egyptologists and archeologists are working on this one (hurray for Belgium), but I don't know a lot of details. It's just I heard this theory that states that the ancient Egyptians may have originated not from the banks of the Nile, but from the Egyptian deserts (probably both east and west) when it may have been green, and those people were pastoral nomads or something-can't remember how it goes but it suggests that the Egyptian civilsation did come from Egypt but was still a migration from the deserts. Also many books I read state that the Egyptians in the south were more 'Nubian' in origin whilst in the north they were more 'Eastern/Mediteranean' in origin, and that there's no doubt influence from indigenous Saharan peoples too. Not sure if this view still counts and I hope this doesn't turn this topic into a fiery racial debate, but I'd just thought I'd mention it. Like that it makes more sense, looking at the earlier apparent rate of population, but still: where would u draw the line? I think it's not an easy thing to decide like that whether they would've come from the regions of Siwa, Bahhariya, Dakhla and so on (actual Egypt) or from a "bit" further, like the Libyan desert. It's a tricky thing to state either one of those as the major influence: we just have too little proof again. I think it's playing it safest to state that there was a native population across the river Nile and further down the Egyptian (nowadays) desert lands, infiltrated by Eastern and Western immigrants, eventually forming a population big enough to sustain the need for an actual kingdom. It almost seems like the only rather doubtless answer. Henceforth you will be know as the Fearless Isisinacrisis! I've tried dodging that bullet for a while now: difficult one. I think the theory still stands, but the main difficulty is that so little has remained of eveidence about the Delta-population - about the Delta at all actually - if you'd be comparing that to the sources we have in Upper Egypt. So it's rather hard once again to have a conclusive theory about that one. An excavating team of the Supreme Council for Antiquities (SCA) has recently reported finding 110 tombs at the site of Manshaat Ezzat at Simbellawein, Dakahlia Governorate. The tombs found to date back to the late pre-dynasties age up until the mid first dynasty comprised three chambers : two storehouses and a burial room. Among the items found in the tomb is a 23X5 cm panel bearing splendid inscriptions that resemble inscriptions on the famous Narmer panel Excavator also found plates, alabaster cylindrical pots of different sizes and knifes of which one bears sunk relief inscription of King Dn the fourth or fifth ancient Egyptian kings. The village of Nashaat Ezzat is about 40 kilometers south of Mansoura and about 20 kilometres southwest of Mandis, the capital of ancient Egypt in the age of 29th dynasty (399-379 BC) It Was also the capital of the 16th province of Upper Egypt in the predestines age. The archaeological site of Nashaat Nasser is an important one that was known before 1998. Most of the area cultivated and it was by sheer coincidence that its archaeological potential uncovered when a farmer reported ding pottery chard on his land. Excavations maintained by the SCA covered housing agglomeration and a cemetery. I wonder what new info will come from this site? isisinacrisis, I bend towards the theory you have mentioned about Egyptians being a mixture of many races that have melted together inside the Egyptian melting pot. I am Egyptian myself and live in Egypt. Recent history shows that Egypt is a melting pot for different cultures. Unlike other societies where people of different cultures stay apart and distinct from one other, most of those who come to Egypt blend in and 'melt' in it with time. The 'melting pot' nature of Egypt has long been known and was first explained by the late Egyptian historian Gamal Hemdan. In very early times, the Sahara was not a vast desert, but a lush, verdant plain. Over on this plain lived various tribes of peoples, along with quite a few types of animals. Over the centuries as the plain gradually dried up, the people became nomads, migrating to various places where they could find food and water. Early in the pre-dynastic era, these nomads moved into what is now known as Egypt, mainly because of the plentiful water supply. They slowly developed into farmers instead of hunters and gatherers. Larger cities grew and grew, until a strong city would rule an area, now known as nomes. Eventually, these rulers of the city-states went on to subdue the rest of the area under their control. One area eventually gain ascendancy over the other--the country became united. The division of the two area was never forgotten, though. Throughout history we hear of Upper and Lower Egypt. Egypt has always been somewhat of a melting pot. Peoples to the North have more of an olive or lighter complexion. Those further South are usually darker, sometimes showing Negroid features. [things like writing (hieroglyphics) were fully egyptian in in creation and inspiration. Inspiration no and creation may be. 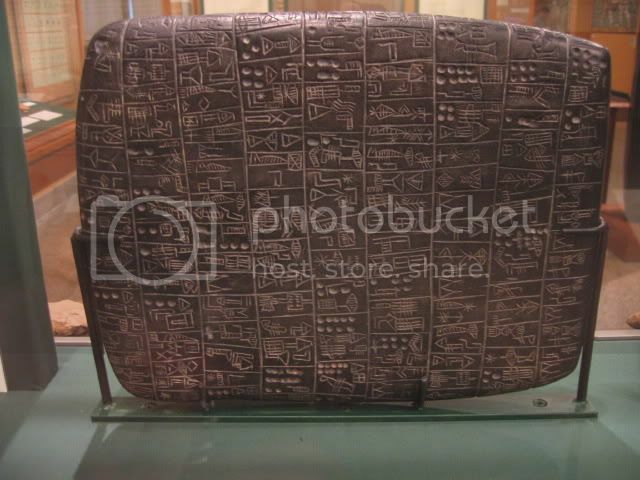 Sumer had a writting system before the Egyptians. The cuneiform script is the last stage of this writting. There is a fair chance the Egyptians learned it, among other things, from people coming from Sumer. There are several example of foreign people inventing an alphabet to help local people to read/write in their own language (eg. European priests in Vietnam). Our earliest evidence for cuneiform in Sumer comes from the protohistorical archaic temples of E-Anna, at the site of Uruk; this dates to around 3,300 BCE. These tablets were an earlier pictographic form of the "wedge-writing" with which most people are familiar when they think of cuneiform, and resembled this beautiful tablet from the collection of the Oriental Institute. Our earliest evidence for writing in Egypt comes from Tomb U-j in Abydos from the Naqada III period and consists of inscribed bone dockets and labels; this dates to around 3,200 BCE. Thus, there is a scant 100 years in the origin of writing between the two cultures. However, it's almost certainly the case that forms of writing pre-existed even these early periods, and that evidence of it in Mesopotamia and Egypt, respectively, either no longer exists or has yet to be found. Most scholars readily agree that Egypt was influenced by Mesopotamia in the time period leading up to Egyptian state formation circa 3,100 BCE. Such things as the palace facade and royal icons like the bull's tail would seem to have been adopted from Sumer or its environs. However, it's equally clear that cuneiform and hieroglyphs are in no way related. The two languages are entirely different and are themselves in no way related (to this day no one is sure to which family of languages Sumerian belonged, but it had no kin in all of the ancient Near East). It's quite possible the Egyptians came into contact with early Sumerian cuneiform, liked the idea, and were thus inspired to develop their own written language. Then again, the opposite might be true. The earliest versions of both written languages for which we have evidence seem to arrive already fully developed. This goes back to the fact that writing must have been going on for some time in both cultures, but we as yet have no evidence for it. At present the available evidence still shows that writing in Sumer developed first, but it's such a slight time span between the two cultures that an archaeological discovery tomorrow might reverse that understanding.